T HE emergency phase of The Salvation Army’s response in Palu is expected to continue for at least two months, according to Indonesia Territory Chief Secretary Lieut-Colonel Yusak Tampai, who has been speaking in an exclusive interview. Food and medical assistance will need to be provided throughout this time, given the scale of the destruction that has been caused by the earthquake and tsunami. Temporary shelter is anticipated to be a pressing need for at least six months, as survivors rebuild their homes and livelihoods. ‘The international community will have a major role to provide support for the recovery,’ he says. In the midst of ongoing aftershocks, The Salvation Army continues to provide medical assistance to hundreds of injured people at its Woodward Hospital in the city. Earlier damage sustained to the facility has now been temporarily patched. Two separate medical teams have now reached more remote villages outside the city, with the intention to enhance this outreach as numbers of available doctors and nurses increase. Following participation in a daily coordination meeting of disaster response agencies in the city, The Salvation Army is today beginning a trauma care programme in some of the makeshift tented communities that have been set up around the city. The challenges of distributing food in locations where supplies are scarce and access routes interrupted is brought into focus in the interview: ‘There are thousands of houses flattened on the ground … many churches, many buildings, including those of The Salvation Army,’ explains Lieut-Colonel Tampai. The Salvation Army teams have been bolstered by friends from the Methodist and Chinese Churches, working together and pooling resources. In some cases, team members have been getting up to pray together from 4.30 in the morning, before undertaking a full day’s service in their local community. Asked how people around the world can help The Salvation Army’s response in Palu, Lieut-Colonel Tampai responds: ‘Prayers would be the first. Secondly, please, please give your donations on salvationarmy.org and we will greatly appreciate it. ‘It’s a sense of being part of the world – it makes [our team] feel not totally cut off. That is encouraging,’ he says. 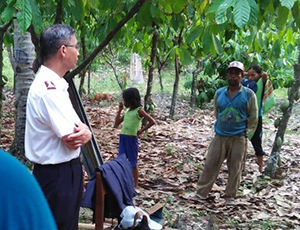 ‘The Salvation Army in Central Sulawesi and the surroundings are very grateful and deeply encouraged by any financial and spiritual support given to help us.